We are a small, lively, active group, in existence since 2001, made up of members with expertise in diverse fields. So our meetings are stimulating discussions. We meet every month, usually on the second Thursday. See past activities. Busy times with things happening at many levels. While the superficial side of Brexit is being fought in Westminster, Brussels and living rooms up and down the country, Government Minister Liam Fox is busy signing post-Brexit Trade Deals in unseemly hurry, the latest this week being with Norway and Iceland (!!). In these Trade Deals he is swapping much of our sovereignty from Brussels to the big trading corporates who have their own powerful secretive Corporate Courts. These are not transparent and MPs have no say in their terms (what price Brexit !?). Through these secretive courts, the corporates are claiming billions of pounds from several countries if they enact anything which affects their profits, raising minimum wage, health standards; for example, Philip Morris Tobacconists claiming £120 million from the Australian Government because their profits decreased after legislation for plain packaging cigarettes! It’s time NOW to stop corporates hammering democracy, using this system of (ISDS) Investor State Dispute Settlement. Some countries have stopped it but not us as yet. Terrible to be coughing up these millions of pounds which could be used for healthcare, education, mental health etc. 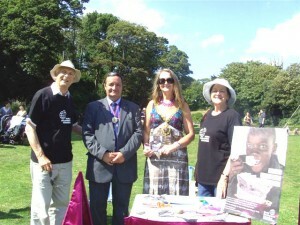 See report in Hastings Online Times. Click here to sign your own card. A group of local members of Global Justice Now met with MP Huw Merriman on Friday 1st March to discuss not just the cost of medicines but why it is time for a new Innovation initiative to re-imagine the system urgently. The situation is in an ever worsening crisis, both here in the UK and around the world, on the cost of prescriptions. The present system of Big Pharmaceuticals having a monopoly on drug prices and Governments accepting, colluding in this, is dysfunctional, costing taxpayers exorbitant sums of money and often not providing access to necessary drugs. In the past year, the NHS spent £20.2 billion on drugs, an increase of 10.9% from the previous year. Even with additional funds the Government is injecting into the NHS, the drugs bill is increasing faster than the budget. Big Pharmaceuticals cry that Research and Development is very expensive. Yes, it is. But they are slow to announce that the public sector plays a substantial role in the discovery and development of new medicines. Globally it has been estimated that the public funds up to two thirds of research and development of new medicines. The US National Institute of Health, between 2010 and 2016, contributed to the basic research associated with the 210 new drugs approved. In the UK, the Medical Research Council, MRC, ( public money ), gross research expenditure in 2017 – 18 was £814.1 million. In effect the public paid twice : in 2016 the NHS in England spent £1 billion purchasing medicines that had received public investment. medicines. This incentivisation has to be innovated. Companies ‘tweek’ the drug formulae and extend the 20 year monopoly by ‘evergreening’ of high sales medicines. Diseases are rated like markets. Between 2000 and 2010 only 37 of 850 (4%) of newly approved products were for neglected diseases that affect middle and low income countries. There are big problems where many diseases need multiple drugs treatment, and TB is an example, with some innovation strategies suggested. The potential savings from a delinked system in which new medicines enter the market at non-monopoly prices, are vast. The model proposes practical steps that can help transition health innovation towards such a model. The report, The People’s Prescription, is co-authored by Global Justice Now, Just Treatment, Stop Aids, Medicines Law Policy, UCL Institute for Innovation and Public Policy led by Professor of Economics Mariana Mazzucato, UCL. There was very good discussion between Global Justice members and Mr Merriman. All agreed that the NHS faces ever increasing demands especially with increasing numbers of an aging population and more successful diagnoses of illnesses, not least mental illnesses, at all ages. Mr Merriman promised to think about the innovation required and would value further discussion. Jack Doherty who led for Global justice agreed we needed urgent strategic political action to save our NHS from exploitation of taxpayers coffers. The Report comes with many more facts and authoritative studies / references (312 in all !! ), some of which are in this summary. Anyone who would like to join in the discussion please use the email address above. economy is also very vulnerable and our vision of assistance for our brothers and sisters locally and globally is critical. and repatriation of profits. The UK and Europe owe a huge historical debt to Africa. The UK Aid budget is a gem in the crown of the UK in an enlightened civilised and compassionate world. Click here to read an appreciative tweet from Huw Merriman MP. 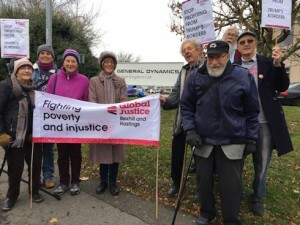 On Friday morning, November 23rd, a group of assorted engineers, architects, farmers, teachers, scientists led by Global Justice Now members and supported by anti-war campaigners from Hastings against War assembled outside General Dynamics in Castleham Road, Hastings. They had informed the company in advance and asked to speak to the Director about grave concerns they have about their parent General Dynamics Corporation in USA. There had been no reply from the Director but information that he had a previous engagement. Nobody came to meet them, but they were promised a meeting soon. We are all aware of abysmal conditions of starvation, poverty, drug warfare, drought , political assassinations, exploitation and religious intolerance, which drive people to seek a welcome and a better life elsewhere —- one might say these are the historic conditions on which USA was made ‘great’! These people recently fleeing across the southern border into Texas, California etc have an expectation of a country that prides itself in being great again with the Statue of Liberty symbol promising to treat them in a humane way. per day, or three times the amount of a typical shelter. There are great delays in releasing children to placements for many reasons, some of which are good safeguarding but monthly releases have plummeted by about two thirds since last year. The children in detention become more anxious, depressed, violent with each other and staff. severe trauma for parents, children and their future. General Dynamics provides “IT, transportation, case management, and other logistical services” to child detention centres in the US (source), and “assists the Office of Refugee Resettlement in processing immigrant-children cases” (source). As such, it has been implicated in the detention of children, and the detention industry in the US in general. Following the global uproar against the Trump administration’s child separation policy, the administration cancelled the separation policy and undertook efforts at family reunification. However, there are still hundreds of children who have not been reunified with their families (and in some cases, probably never will be). However, the issue runs deeper than the specific case of families being torn apart. Under the Trump administration, the number of children held in detention in the US has skyrocketed to the highest ever levels, from around 2,400 in 2017 to over 12,000 now. Furthermore, despite back-tracking on the specific issue of family separation, the Trump administration is pushing to dramatically increase the amount of time undocumented families can be detained, as well as to speed up deportation processes. See also Hastings against War website for further information about General Dynamics. 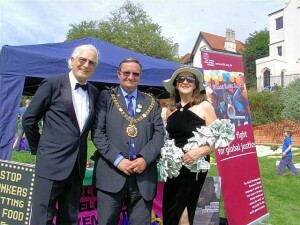 “Once again we were at the St Leonard’s garden annual event organised by the Hastings Interfaith Forum. We played the new medicines game, “The Price is NOT Right ” to great effect; even several medical professionals were shocked to see the hard hitting evidence it presents. 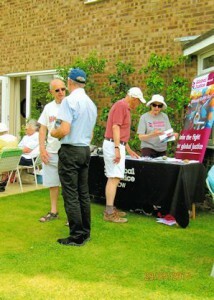 Information from our Migration campaign also went well. We seemed to be talking non-stop for about 4 hours,but , mysteriously, I still was able to consume a few pieces of delicious, homemade cake and two helpings of wonderful curry”. 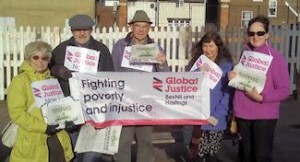 The sign says “welcome”, but the message from Bexhill and Hastings Global Justice Now group was to stop the shaming lack of welcome from the U K to people arriving here seeking safety and peace. 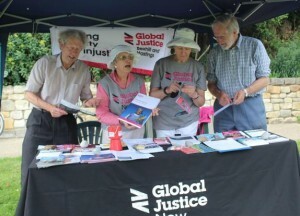 Global Justice Bexhill & Hastings ran a stall at the annual garden party of the Hospital League of Friends, and were able to hand out a good number of campaign cards to health professionals; they in turn will distribute them to colleagues in Hastings and Brighton as well as in Bexhill. The Price isn’t right game was very successful in the amount of disgust it engendered over the rise in prices charged for drugs by the pharmaceutical companies. 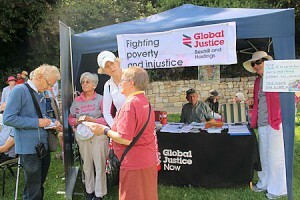 The stall of Global Justice Bexhill & Hastings featured information on the Trade and Pharmaceutical campaigns. Julia Dance dressed as a bee to celebrate the almost complete ban on neonicotines. Unfortunately the celebrations were premature, as the big companies have already found a loophole. Medicine – for People or for Profit? In December 2017 members of Global Justice Bexhill & Hastings challenged the Pharmaceutical Industry to stop profiteering from vulnerable people, especially overseas. If you’re ill with cancer or chronic debilitating conditions and medicines and drugs are available, what rights have you to receive them on prescription? Necessary degree? Cost? Criteria? Post code? Poor country? Global Justice Now organisation has researched the cost problem and clearly concluded that artificially greedy high prices can and must be tackled as millions are suffering and dying, affecting families and economies worldwide especially the poorest, while the remedies are kept too expensive. 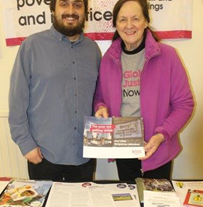 Local members of Global Justice Now of Bexhill and Hastings campaigned on Friday 1st December, coincidentally World AIDS Day and and met many of the public. There is great concern and anger out there. The NHS / NICE is rationing many drugs for thyroid, cancers, arthritis etc despite the public sector playing a pivotal role in discovering many of the new medicines. Of the 37 million suffering HIV globally, over half are not receiving anti retro viral drugs and about 1 million die each year. There is a 42% profit margin of HIV drug producer Gilead. Across all areas of health Research and Development, R&D, the U.K.. government spent £2.3 billion on health R&D in 2015. Globally, it is estimated that the public pays for two thirds of all upfront drug R&D costs. Drug Pharmaceuticals Companies take out patents on developed drugs. A patent gives a company exclusive rights to a new drug for 20 years. Without competition, companies can demand whatever price they like. They can extend this where minor amendments are made to the medicine. The companies claim they need this to undertake further R&D for new drugs. But when the public purse, tax payers and donations are funding large parts of this R&D, the justification for monopoly is hard to sustain. Last month, the Canadian Parliament passed a motion with the goal of lowering drug costs and increasing access to medicines, both in Canada and globally.. The new health minister in The Netherlands has announced that the Government wants to ” change the rules of the game” to tackle the “absurd” medicine pricing. He is exploring if he can override drug patents. Moreover Pharmaceutical companies consistently spend more on sales and marketing than on R&D for new medicines. Many companies also spend disproportionately more on shareholder dividends and buying back their own shares to artificially boost their share price than they spend on R&D. We call on the Government to save the NHS by tackling this monstrous problem.. We call on NHS patients and future patients ( (!!) to ask our MP, Mr Huw Merriman, to act for us here. The high prices for new medicines are unsustainable for an already underfunded NHS, and put these treatments completely beyond the reach of patients in developing countries as well. Refer also to the film, Fire in the Blood. Attach public interest conditions and monitoring in the R&D processes. Introduce transparency with knowledge and evidence of true costs of R&D and what constitutes a fair price. Develop guidelines for departments that fund R&D on prioritising public health over commercial interests with monitoring and accountability. Finally, the Government could actively encourage the World Health Organisation, WHO, to support a global biomedical R&D convention which could encourage and enable generic and biosimilar drugs to enter the market affordable for all. How long have we to wait for action here?! 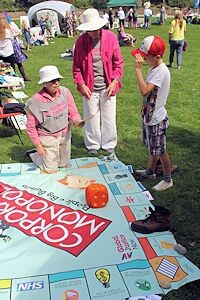 In August 2017 our stall at the Interfaith Festival in St Leonards Gardens included a giant Monopoly board with a Global Justice message. 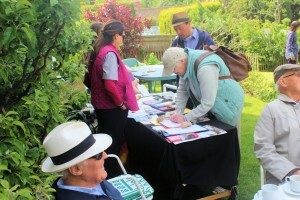 May 29 2017 stall at Bexhill and Hastings United Nations Association Open Garden. 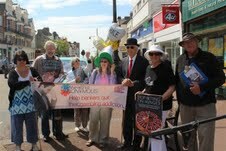 April 22 2017 Bexhill Town Centre action to raise awareness of the increasing levels of violence and oppression faced by small‐farmers across the world and asking residents to sign postcards directed to the Foreign Office to demonstrate public support for the UN Declaration, negotiations for which were due to begin in May. 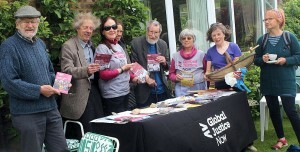 Many action cards calling on the UK government to support the UN Declaration and recognise the rights of small ­farmers, who are crucial for feeding local communities across the world, were distributed and signed. See the May 2017 issue of Think Global. The training was delivered by Jo Hiley of ‘ Hope Not Hate’ (HNH) on January 21st 2017 at the Friends Meeting House, Bexhill. 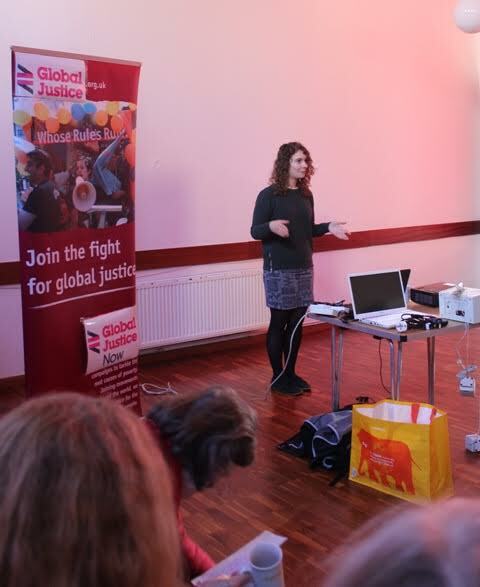 The session was funded by Global Justice Now and organised by members of the Bexhill and Hastings GJN group. There were 27 participants from diverse backgrounds, all of whom were very engaged and concerned about how best to talk to people about migration and other, sometimes difficult, issues. WHO ARE WE TALKING TO? People who agree and those who disagree with us were shown in diagrammatic form as a ‘spectrum of support’. This showed that we succeed best when trying to shift people’s perspective just one notch towards understanding and empathy; the negative remarks people make were outlined as were the ground rules to follow when confronting people; myth and myth-busting was explained. A video was shown of someone using these approaches, successfully, on a doorstep, to discuss LGBT rights. Finally there was a practice session working in pairs. Further discussion at Global Justice meetings and a possible social event to bring together people of different backgrounds and cultures. Making contacts with related organisations to give and receive support., e.g The Refugee Centre in Cardiff. Go to ‘Hope Not Hate’ Facebook page to share experiences and ask for feedback from them regarding their ‘Schools’ Project’. The format of the session was informative, practical and allowed plenty of time for interaction and discussion. The training highlighted that you need to know your topic well and underlined the effectiveness of linking the discussion with local issues if possible. Learning to listen was stressed as was having conversations rather than arguments in order to convince people. Jo (the speaker) was brilliant, articulate, thought provoking and professional in facilitating and leading the event. Looking forward to using and following up on the many skills learnt so that the humanitarian voice can be heard. Good to be given help to tackle difficult situations by learning to listen and not to think that I must convert this person to my way of thinking. Must remember: “2 Ears, 1 Mouth” i.e. 2 parts listening and 1 part speaking. Globally 65 million people are displaced from their homes after fleeing from war or persecution. Over 25,000 migrants have died in their attempt to reach or stay in Europe since 2000. 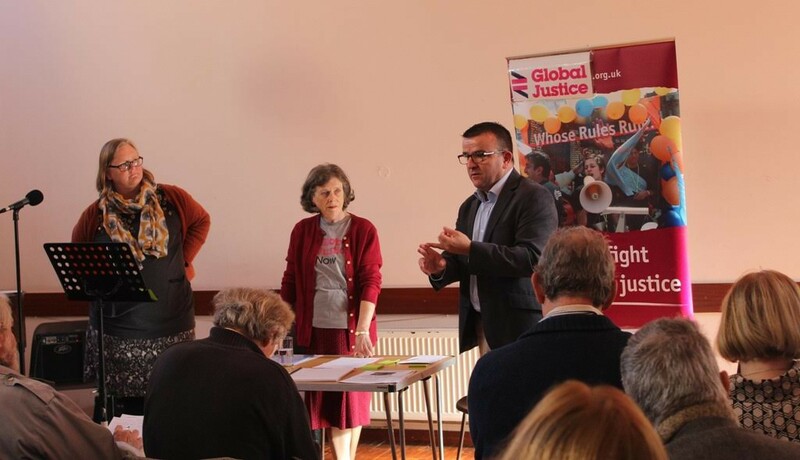 Over 50 people joined the Bexhill and Hastings Global Justice group on Saturday 22 October to ask: ‘What is the real solution? What are the root causes? and What can we do?’ Three speakers tackled the issue from different angles and Mike Surman contributed with a moving song he had composed. 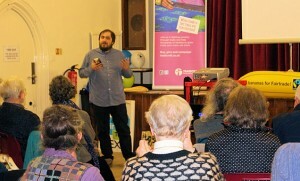 Aidan explained how the diocese “continues to look for innovative ways of working with a variety of partners to enable as many people in their communities as possible to become engaged in the work of supporting refugees and asylum seekers.” Those partners currently include Voices in Exile in Brighton and the Society of St Vincent de Paul in Hastings/St Leonards. Jack Doherty explained the Global Justice position on migrants: “The migrant situation is a symptom of what is happening. It will continue and get worse if the causes are not addressed! I believe there are 6 main causes. Where does responsibility lie? Certainly not with the migrants themselves”. He then cited the main root causes driving people to flee from their homes: war, poverty, inequality, climate change, unfair trade deals and colonialism. For example the beginnings of the Syrian conflict were exacerbated by the severe drought in that region causing many rural people to move in desperation to the cities. Jane Grimshaw from Hastings Supports Refugees gave a graphic account of the splendid efforts made by people in Hastings in collecting food, shelters, clothes, pots and pans and whatever has been needed to make conditions for the migrants in the Calais ‘Jungle’ a little bit better. Jane suggested pressing Hastings MP, Amber Rudd, now Home Secretary, to implement the Dubs Amendment straightaway and arrange for vulnerable children with family in the UK to be allowed in. Peter Bolwell urges us to click here and watch a video of tribal Brazilians desperately resisting expulsion from their land. We were pleased to have the opportunity to have a pitch once again at the wonderful annual multicultural interfaith Summer gathering in the delightful setting of St Leonards Gardens and were blessed once more with sunshine. 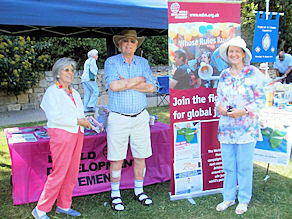 Members manning the stall were very pleased with the great interest shown in Global Justice Now campaigns and the number of people signing up. On May Bank Holiday Monday 2016, we were kindly invited to hold a stall at the annual Open Garden event run by the Bexhill and Hastings United Nations Association. The setting – Ed and Barbara Echlin’s beautiful organic, biodiverse food garden – provided a wonderfully apt backdrop for us to spread awareness about Global Justice Now’s work, with a focus on our food sovereignty campaign. 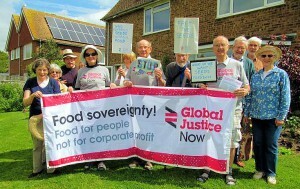 Many interested people shared misgivings about the extent corporate players are involved in our global food systems, and we gathered new signatures for our petitions as well as giving out many leaflets and action cards. But we found that whilst Monsanto may have gained a reputation for being less than exemplary in terms of its ethics and social and environmental impact, the actions – even existence – of the New Alliance are far less well-known. So what is the New Alliance? And why should we be concerned? Run by the G7 countries, the New Alliance for Food Security and Nutrition is an aid scheme that claims it will lift 50 million people out of poverty by 2022. The UK alone is pumping £600 million of aid funding into it. However, in return for aid African countries have to make changes to their land, seed and trade rules that benefit big business including Monsanto, Unilever and Nestlé. This is at the expense of the small-scale farmers who in fact supply the majority of the continent’s food. These farmers now face the risk of land grabs, seed privatisation, the spread of harmful chemicals and increased debt, whilst cash crops for export are prioritised by corporations over the food that will feed local communities. No wonder then, that African farmers’ groups have described the initiative as like ‘a new wave of colonialism’.  Global Justice Now activists across the country have therefore been campaigning against this scheme, lobbying our MEPs and demanding that the EU ratifies a strong critique of the New Alliance. And indeed, this work seems to be paying off: a highly critical report has been accepted by the European Parliament, highlighting numerous concerns and shortcomings of this corporate model of agriculture. So we need to maintain pressure on the EU, and to demand accountability from our own government: is this really how we should be spending our aid budget? We believe, clearly not. Better would be the promotion and financial support of the international movement for food sovereignty. As part of an international alliance that includes farmers, peasants, indigenous peoples, activists and many more, we are calling for a food system that benefits people and the environment, not just the profit margins of big-business. Food sovereignty gives control and ownership of the production, trade and consumption of food to communities, not corporations. And it values sustainability, biodiversity and environmental protection: agroecology, not agribusiness. 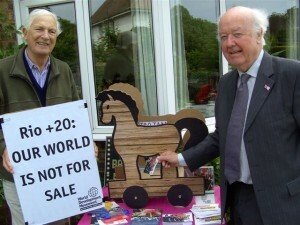 This ethos is clearly alive in Barbara and Ed’s garden, and visitors to our stall couldn’t fail to see the value of it. We hope that many more will join us in our campaign, and help fight for a world where food, land and seeds are where they belong: in the hands of the people who need them to survive. Soon the EU is to decide whether or not to relicense Monsanto’s flagship weed killer Roundup. 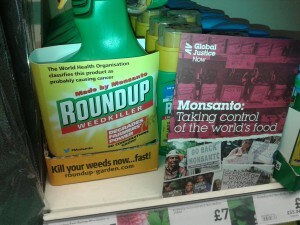 Roundup contains the dangerous chemical glyphosate which is “probably carcinogenic” according to the World Health Organisation. On 18th January 2016, Bexhill and Hastings Group of Global Justice Now showed a film, This Changes Everything. It raised many issues both globally and locally. 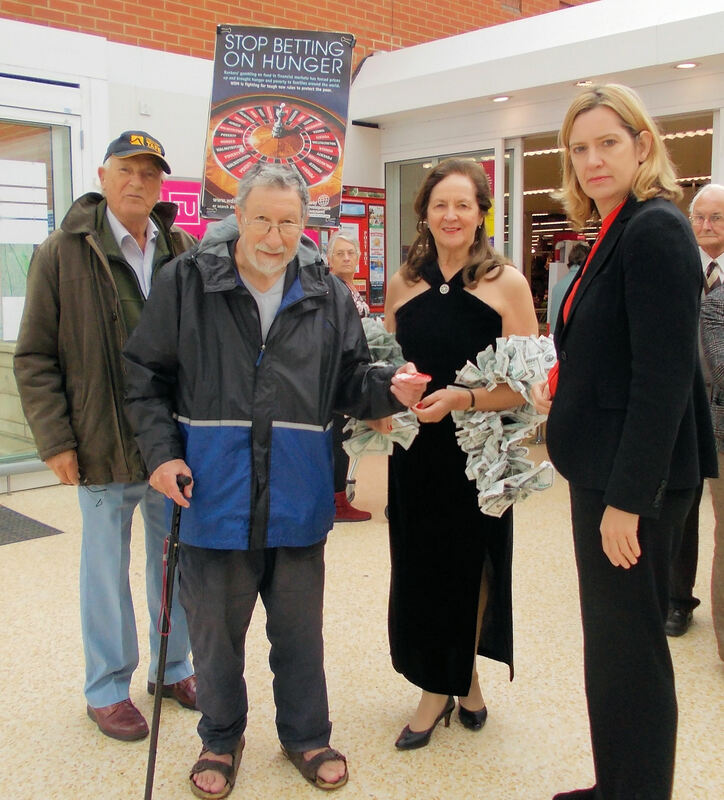 Locally because Hastings MP, Amber Rudd, and recent Bexhill and Battle MP, Greg Barker is/was Secretary of State for Energy and Climate Change respectively. Using stunning cinematography, and narrated by the author of the book of the same name, the film visited seven locations across the world from China and India through Africa to Canada, showing catastrophic changes locally having global effects. Everything is changing. The CO2 is causing temperature increase in our atmosphere — unfortunately referred to as ‘warming’ which feels good ! This dries soil and evaporates more water from oceans and seas which cover 70% of the earth’s surface. This heat inevitably gives more energy and water which drive winds, tornadoes, rain and snow to new record levels! Mining industries for coal and minerals and for fracking are unleashing wastes and poisons into our water supplies, our air and soil supplying our food! Eating and drinking our waste!! Our global waste bin is full and overflowing!! What if this is not just a crisis? Who is in charge of this ‘progress’? Is there an alternative? What will it cost ? Is there a choice? What environmental problems are we passing on to our children, grandchildren and future generations ? A large section of the refugee crisis stems from climate change, droughts, flooding and resulting starvation eg Syria 2000 to 2006, Ethiopia, Sudan, Darfur. The droughts and refugees will continue to move north in greater numbers from parched land and desertification. Are we driving them towards us !? The Paris Climate Agreements in December are based on keeping the temperature increase to 1.5 to 2 degrees, which is near the precipice anyway! Scientists have done the relatively simple calculation of how much coal, gas and oil can be burned to produce the CO2 which will bring this about by 2030. And, would you believe the fossil fuel corporates have five times that amount in reserve !! The film showed the graphic contemporary evidence for this. It also showed the devastation on habitats from misty smoggy Beijing residents in masks to multiplying coal-fired power stations in India, to ruined areas about the size of England with tar sands in Canada. In all these and more, there is growing dissatisfaction and anger in local communities who recognise the false dawn and who are suffering. The best place for fossil fuels is to be left in the ground where they are. The Swedish researcher, Andreas Malm, shows when the rise of neoliberalism allowed corporations to outsource dirty industry to low cost countries and China, there was a spike in global carbon emissions. There’s a causal link between cheap disciplined labour and raised CO2 emissions. The World Bank and International Agencies have warned we’re facing a calamitous global temperature rise of 4 to 6 degrees. Can this be altered? Germany has moved from 6% renewable energy sources to 26%. The UK is on course to reduce solar! There are about 1 million jobs being developed in renewables in S Africa. The intelligent planning for 24/7 use of non-polluting wind, air, sun and tide is blindingly obvious both in the West and the developing South and East (continents). The moral argument of ‘The Polluter Pays’ places large responsibility on our taxing shoulders for the past and to take evasive mitigating action for the future. We elect our governments to protect us from foreign invasion which now includes air and water invasions which are threatening our survival. We must also help China and India to stop surrounding us in earth- warming CO2. There was both a lively and sombre question and answer session on these issues after the film. 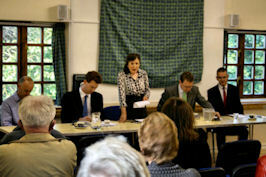 Discussion was chaired by Christina Lucey of Global Justice Now aided by Barbara Echlin, John Fowler and Jack Doherty. Concern was expressed about the power of the fossil fuel conglomerates and over-arching greed and, not least, their power in the US over both political parties and consequently over Congress. In spite of their astronomical profits they received over $1 billion in governments subsidies. The $45 billion made in one year by Exxon is the most of any company ever. Why not nationalise Energy Companies? Germany is moving that way. The effect of methane emissions from cows is 25 times worse than CO2 for the atmosphere; so we have a responsibility to reduce our high meat diets (apart from for health reasons also). Will this film change anything? The answer is NO! But each individual in their own life choices CAN and each MP/Councillor MUST change our direction and grasp the difficult choices. Why not make it a building regulation to have solar panels on every new house, a small percentage price addition but equivalent to a clean power station and providing employment! The outcome? Barbara was right! See also the report in Hastings Online Times. 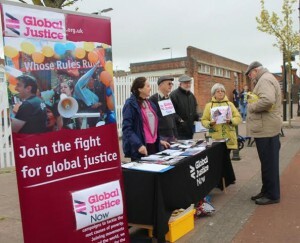 Why did local members of Global Justice, Fairtrade and 38 degrees in Bexhill assemble in Devonshire Sq on a cool windy Saturday morning ? 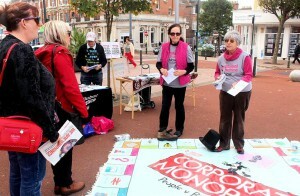 It was in solidarity with a European day of action against a secretive Treaty being hammered out undemocratically between the EU and US which will affect the freedom of local authorities and governments in decision making when these adversely affect the interests of large American corporations. It has taken a year for the EU Trade Commissioner Malmstrom to be forced to bring a little transparency into the situation and is grudgingly publishing some sections of some of the texts!! This TTIP ( Transatlantic Trade and Investment Partnership ) has no agreement among economists on its effects until 2027, not surprisingly, as who predicted the economic and trade effects in 2003 to now ?? It claims — wouldn’t it – to bring £10 billion of job creation ! NAFTA, a trade deal between US, Canada and Mexico made similar claims and lost around a million jobs in US alone. TTIP might produce miniscule benefits but at disastrous costs. Almost 40 councils in the country have passed resolutions critical of TTIP, including Oxford, Lancashire, Brighton, Flintshire and, yes, Hastings. There has been no impact assessment on the potential impact on local councils. There has been no scrutiny of the negotiating texts by local government and no consultation with local government representatives. Even MPs are unable to scrutinise negotiating documents. 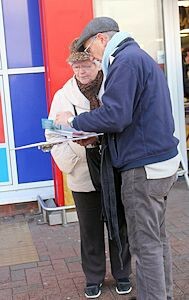 Many hundreds of locals in Bexhill and Rother have signed petitions to stop dodgy TTIP in line with over 3,500,000 signatures in UK and continental Europe. 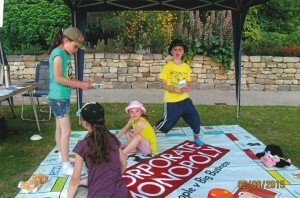 Julia Dance led the specially adapted Corporate Monopoly game with local pedestrians in the square, using fact cards and locations illustrating the creeping dominance and exploitation of many corporates. We call on our Rother District Council to revisit this TTIP resolution after a very unsatisfactory and at times ill informed debate about seven months ago when some members confused it with party political election materials. Many people said they are worried about losing hard fought for rights and working conditions and about US corporates dumping inferior tested foods and medicines on Europe. Power must not be allowed to eat the powerless. 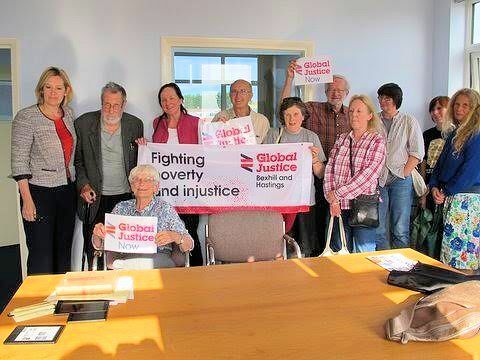 On Friday 11 September 2015, local members of Global Justice Bexhill and Hastings met Hastings MP Amber Rudd. After congratulating her on her elevation to the Cabinet as Secretary of State for Energy and Climate Change they questioned the priorities of her Department. • Zero Energy targets for new buildings are being postponed. In the run-up to the Paris climate negotiations these priorities are at odds with recent initiatives in America and China to cut greenhouse gas emissions. Global Justice Now fears that people in the Global South, who have contributed little to global warming, will be the first to suffer as their wells run dry and their crops fail. • Reduction in carbon emissions. Amber Rudd agreed with Pope Francis, Desmond Tutu and Angela Merckel that climate change poses great risks to the human family. 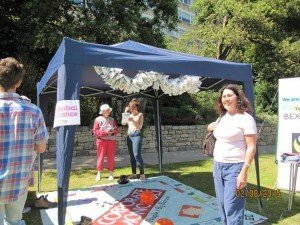 She was disappointed that, on the doorstep, this issue was not raised during the General Election by her constituents. Her visitors insisted that climate change should now be treated as a moral issue, not merely as an economic or political issue, in view of its effects in the Global South. Amber Rudd was anxious for Britain to show leadership in preparations for the Paris Conference, by ensuring our reliable energy provision at home, and by maintaining our overseas aid budget giving confidence of continuity to recipients. Amber Rudd justified generous treatment for the nuclear industry – guaranteed tariffs for about 35 years – on the grounds of its independence from overseas sources of fuel. Solar and wind could not guarantee round-the-clock energy. This generosity contrasted with coolness towards tidal, wave and other sources of renewable energy. Amber Rudd placed her confidence in carbon capture and storage, despite the questionable economics. The Conservative election manifesto had promised a reduction in subsidy for on-shore wind. Wind farms could still get planning permission if desired by the community, but would have to be financially viable without subsidies after April 2016. A few on-shore wind companies have been willing to go ahead unsubsidised, suggesting that the industry is ready to survive the withdrawal of the subsidy. This was seen as discouraging a proven resource for decarbonisation. Amber Rudd cited a report commissioned before the General Election which had recommended an 87 per cent reduction in feed-in tariffs. No final decision has been taken on this, but a significant decrease is certainly intended. In addition much of the profit from the solar industry has gone to overseas companies, at the expense of British taxpayers. Again the effect of Amber Rudd’s decision was felt to be discouraging. Amber Rudd maintained that energy-efficient homes would be more expensive and would take longer to build. The Building Regulations deadline for new zero energy buildings is therefore postponed in favour of maximising the number of new homes. This relaxation has penalised energy-conscious builders and professionals who had been gearing up for zero energy construction. The one moment of all-round enthusiasm occurred when Amber Rudd warmly supported the Nottingham Community Energy initiative. Could we hope for a similar initiative in Hastings and Rye? On Friday 1st September a joint meeting of Hastings Against War and Hastings & District Interfaith Forum watched an inspiring new film Seeds of Sovereignty. It highlighted the crisis in the Global South as indigenous sustainable farming gives way to a multinational commercialised agricultural system, geared more to filling our supermarkets than to the survival and welfare of the farming communities. This has political, social and spiritual consequences. Barbara Echlin and John Fowler respond to questions. 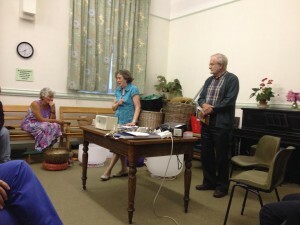 The two speakers, Barbara Echlin and John Fowler, both members of Global Justice Bexhill & Hastings, spoke from personal experience about the need for agro-ecology and food sovereignty. 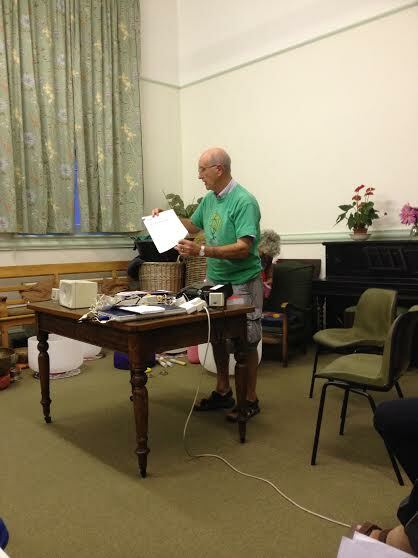 Finally Jack Doherty introduced the work of the local Global Justice group. See the report in Hastings Online Times. Negotiations on TTIP (the Transatlantic Trade and Investment Partnership) and the ISDS (Investor to State Dispute Settlement Mechanism) are ongoing. The following extracts are from statements by local MEPs on the current debate in the European Parliament. The negotiating mandate given to the Commission by the Member States (including the UK) contains a request to possibly include an ISDS clause that would allow investors to initiate proceedings directly against the US government should they believe that their property has been expropriated illegally, or if they have been discriminated against by the country in contravention of the commitments contained in TTIP. Member States including the UK want to encourage foreign investment and seek the benefits that this brings. It therefore seems right that such investors can rely on nations to act in accordance with the trade agreement. It is akin to a claim for damages where a government unfairly breaches a contract. I am reassured that both the EU and USA are committed to ensuring that legislation reflecting legitimate public choices, e.g. on the environment, cannot be undermined through ISDS claims. I am particularly concerned about the proposed Investor-State Dispute Settlement Mechanism (ISDS), I think that ISDS in its current form is seriously flawed. As has been seen in past agreements, secretive tribunals using private arbitration give too much power to multinational corporations and undermine the democratic process. At the same time, UK businesses do need some form of protection from arbitrary decisions by foreign governments when they invest overseas, including in the US where legal systems can vary from state to state. That is why I will be voting to get rid of the flawed ISDS with the aim of replacing it with a new form of investor protection, one that protects the investments of companies overseas but in a fair and transparent way. I want to see private arbitration scrapped not only from the ongoing TTIP negotiations, but from all trade deals around the world – including those with developing countries where it has been abused in the past. Many countries in the world are already turning against ISDS. I believe the EU should lead the way in replacing this flawed system with a public International Investment Court, dragging these secretive decisions into the open and ensuring judges are appointed independently. Labour MEPs are supporting an unambiguous amendment to this resolution, calling against the inclusion of ISDS in TTIP. Labour MEPs have also tabled a series of amendments to call for a full exclusion of public services. We have developed these amendments together with public services users, providers and employees and are confident that the legal language we propose is absolutely watertight. We have also tabled amendments to defend our standards, notably in terms of regulatory protections for workers, consumers and the environment, as well as food safety. The Greens and I want to see an exclusion of public services from the scope of the TTIP , a commitment to ensuring that regulatory cooperation between the EU and the US doesn’t end up watering down our current standards, and, of course, the exclusion of the ISDS mechanism. The TTIP is also set to include a strong focus on regulatory cooperation, but the Greens are concerned that the social and environmental standards in the EU and the US are very different and that governments could find their national legislation on many crucial issues – such as fracking, GM produce and hormone beef – coming under pressure. I would like to assure you that I will not vote in favour of the TTIP if it contains ISDS provisions and unless significant changes are made to address the objections of the Greens and EU citizens. 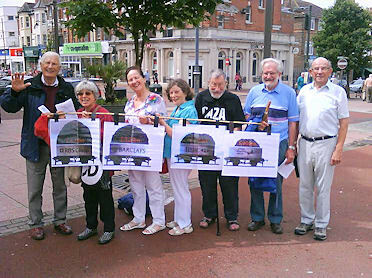 Denis, 88, was a committed campaigner who, with his wife Christina, belonged to various groups which worked in the community such as Bexhill Fairtrade Committe, CAFOD, the official aid agency of the Catholic Church in England and Wales, and Global Justice Now, as the World Development Movement (WDM) has renamed itself, and was a familiar sight on our streets taking part in many activities in his fight for a fairer world. Denis was a gentle giant in our midst, always smiling but driven with a determination for justice, fairness and transparency. His vivacity and enthusiasm belied his age. Until very recently he was setting out stalls, dressing up for street demos and doing his delicate caring for his garden. He and his wife Christina have been key members of St Mary Magdalene Parish and choir for years. Denis’s wisdom and sagacity at meetings will be sorely missed. As well as being an all-round loveable man for family and friends, he was consumed with a desire to actively change the lives of people, especially the voiceless and deprived. Denis, of Maple Walk, grew up in north-east England but went on to travel and teach in Argentina where some of his children were born. On returning to Britain he settled in Bexhill where he worked as a language teacher in Downs Secondary School for boys in the mid-1960s. In 1968 Denis played an active part in the action mounted by the National Association of Schoolmasters (NAS) to safeguard teachers’ positions when schools were reorganised and amalgamated – Bexhill was where the national principle was won and established for future negotiations. His first wife Patricia taught languages in St Mary Magdalene primary school. With their four children – Michael, Tony, Ana and Helen – they became life-long friends with fellow foreign language teachers Christina and Val Bowler, and their children Joseph and Margaret, sharing a common interest in multilingual cultures. After both Denis and Christina were bereaved, their friendship blossomed and they married 15 years ago. In about 1970 Denis left Bexhill to become deputy head of Chatsmore School in Worthing. 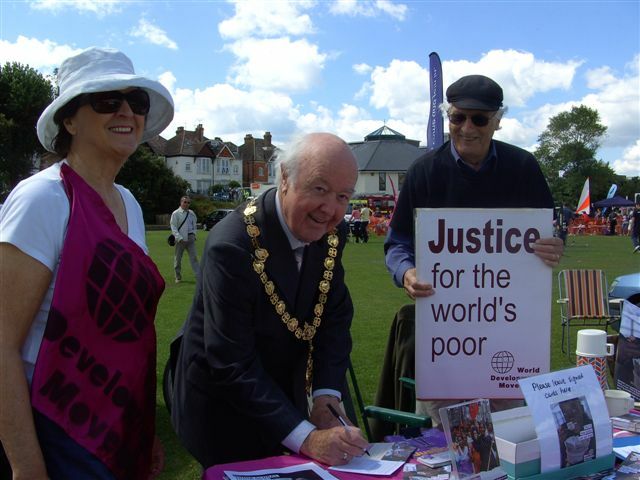 Here he became active in the local branch of the World Development Movement and continued this work on returning to Bexhill, along with his wide aim of combating inequality in the world. 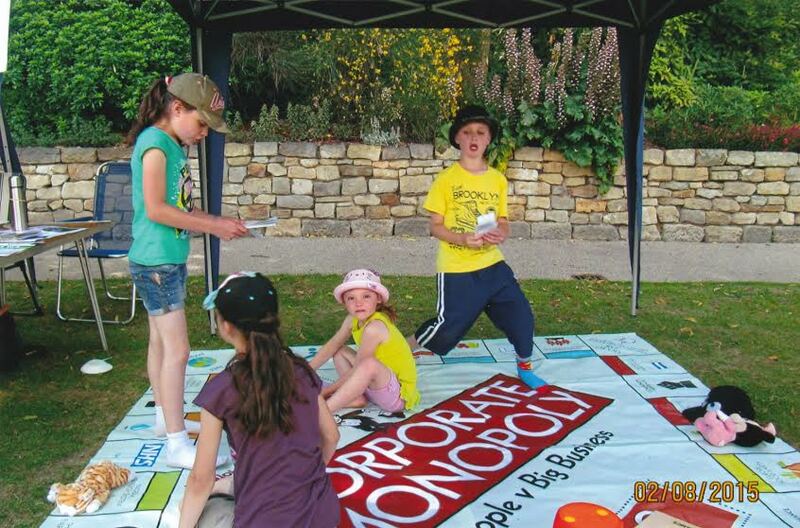 This led him to support Fairtrade and take part in demonstrations such as highlighting the monopoly practices of the banking and corporate world in food production and pricing. He used a fair lens of justice and peace. He joined the Jubilee 2000 movement for debt cancellation in Worthing and Bexhill in 1999 and participated in marches in Cologne. After this, together with local vicar Helen Dollenson, he resurrected the local Bexhill and Hastings WDM which he led vigorously and inspirationally from then on. He and Christina have been on marches in Prague, Copenhagen, Brussels and Paris, as well as many cities and towns in the UK. He lobbied MPs and MEPs on a range of issues, including the controversial Transatlantic Trade Investment Partnership (TTIP) under negotiation by the United States and the EU. 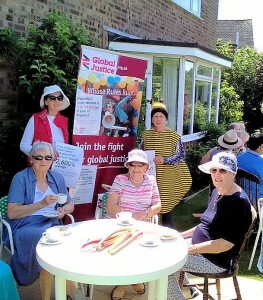 On Spring Bank Holiday Monday the Bexhill and Hastings Group of Global Justice Now took part in the annual Open Garden event of Bexhill United Nations Association. This was held in the garden of Barbara and Ed Echlin, renowned for its bio-diversity. The Global Justice Now stand warned that multinational agri-business corporations are pushing their own patented hybrid seeds to become the only seeds in future farming in the world’s poorest countries. Global Justice Now promotes the perpetuation of the diverse seeds that small farmers use in developing countries to control their own food systems, protect bio-diversity and build resilience to climate change. The movement against TTIP and other undemocratic trade deals is growing fast. On 18th April thousands of people took part in more than 700 actions across the world to protest a new generation of neoliberal trade agreements that are threatening to undermine democracy. 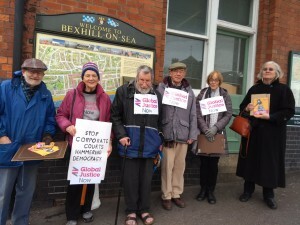 In Bexhill, Global Justice Now supporters and other activists took to the streets and Devonshire Square in solidarity with supporters in 32 towns and cities in the UK to put an end to the EU-US trade agreement. The targets are the corporations that could use TTIP to grab control of our NHS, our food, and our environment. Members spoke to passers-by about TTIP and an amazing finding was that less than 10% of people actually knew about this Treaty which is being negotiated in our names and which, if it comes into force as proposed this summer, will affect all of our lives for many years. It poses threats to democracy, public services, food safety, our environment, workers’ rights, personal privacy, financial controls and not surprisingly has been negotiated largely in secret!! Even many MPs and MEPs are unaware of who and what is being agreed. David Cameron could have fought to have the NHS included as an exemption but has chosen not to. TTIP is set to remove many of the new financial regulations (such as banking safeguards) which have been introduced since 2008 to prevent a future financial crash. Many people said they wanted to hear from our candidates what they propose to do on these matters. Some countries such as Ireland will need a referendum to deal with this Treaty but here in the UK it might not even be debated in Parliament! 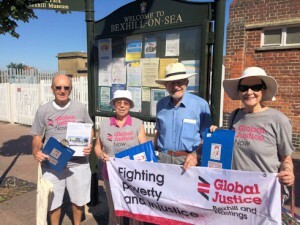 Denis Lucey, chair of local Bexhill and Hastings Global Justice Now Group, said “Saturday was an important moment for our movement for a more just world. In the run-up to the general election we have shown decision-makers that we are ready to stand up for our democracy, our public services, our food and our environment”. Julia Dance proclaimed optimistically “The good news is that if we stand together we can stop TTIP”. Have we time? 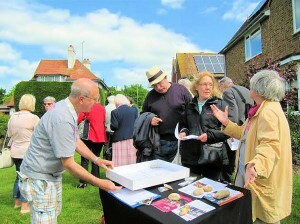 The campaign was resumed on 24th April. 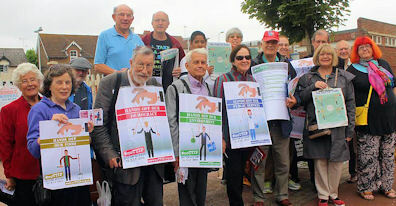 Group member Jack Doherty reported: “We had a good group taking part in the 38 Degrees appeal Save our NHS, filling many sheets with signatures to save our NHS from take over by corporates, and especially to have it exempt from TTIP. There’s a lot of work to be done for our fair democracy as very few people know about TTIP and even fewer know about important details affecting hard-won safety rules for our food and animal welfare. We need to accelerate our work before polling day. Three of our prospective candidates turned up — Labour Michelle Thew, LDP Rachel Sadler and UKIP Geoffrey Bastin, each of whom signed our petition. It is fair to say that Michelle was most in command of TTIP details, safeguarding on NHS and other factors”. 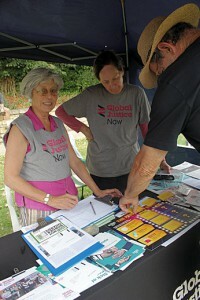 Christina Lucey added “ It was good to be able to tie this action into our Global Justice action the Saturday before. 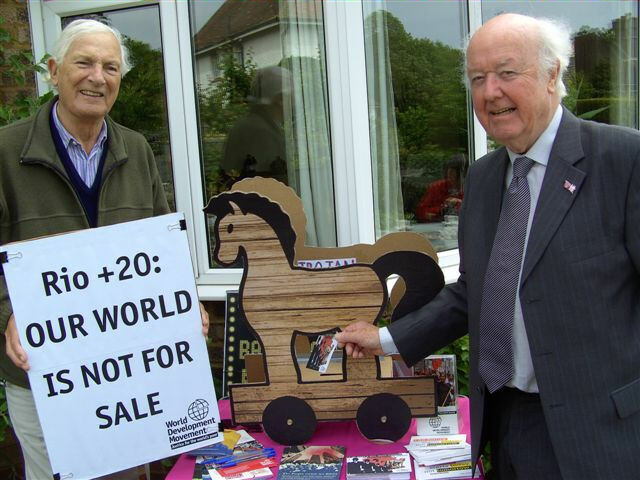 The candidates were keen to learn about TTIP and were pleased to be offered copies of the ‘NoTTIP Times’, some taking a number of copies to give to their members”. To mark our change of name, from the World Development Movement to Global Justice Now, we joined with Bexhill Fair Trade Group in presenting a great evening of films and discussion about power and inequality across the world, and what people both here and in the global south are doing about it. “A rich mix of documentary film and live expert input brought the conflict between global agribusinesses and family farming in the poorest countries vividly before an appreciative audience of Global Justice, Fairtrade and CAFOD supporters,” commented Julia Dance. 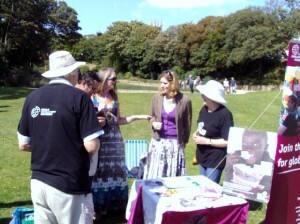 Alex with Christina Lucey of Global Justice Bexhill and Hastings. The guest speaker was Hastings-born-and-bred Alex Scrivener, policy officer at Global Justice Now and author of The Poor Are Getting Richer and Other Dangerous Delusions. He briefly explained the reason for the change of name: “Unlike the World Development Movement, the meaning of Global Justice Now is immediately recognisable: we want a fairer world and we want justice for the world’s poor NOW”. During the question-and-answer session after the film, Alex explained that in Africa a new colonialism is taking place, as huge agribusinesses take over large areas of fertile land and develop farms on an industrial scale. This ties farmers into purchasing new patented seed each year, along with the deadly chemical pesticides and artificial fertilisers that are required for this type of farming. Far from helping to feed Africa, the result is increased poverty and the inability of small-scale farmers to feed their own families. The bulk of the crops grown is destined for export and large sums of money are being invested in constructing highways to ports to facilitate this process. “It is scandalous that the DfID (Department for International Development) is putting a huge amount of money into large corporations like Monsanto, which is forcing farmers to plant prescribed seeds. Aid money meant for helping the poor, with the assistance of the UK government, is harming the poor,” he said. 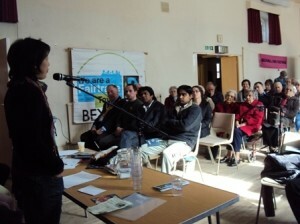 After an interval for Fairtrade refreshments and Fairtrade wine tasting, the second film, Fairtrade Matters, was shown. Made recently by the Fairtrade Foundation in a small remote village in Malawi, it showed how fair trade is giving the villagers an income which has enabled them to build a bridge enabling an ambulance to reach their village. The evening concluded with a discussion on the Transatlantic Trade Investment Partnership (TTIP) which the EU is negotiating with the US. Alex explained how TTIP would grant big businesses the power to sue governments, lock in the privatisation of public services such as the NHS and education and undo regulations to protect workers and the environment. He gave some startling examples of the consequences of similar country/corporation deals which are already happening in Australia, Argentina and Egypt, where the governments are being sued because of legislation which adversely affects corporate profits. In Australia tobacco giant Philip Morris, whose sales have dropped since a law requiring the plain packaging of cigarettes was introduced, has taken the government to court. Here our NHS is slowly being privatised and if the TTIP treaty goes ahead it will be impossible to bring it back under government control. Our farming expert John Fowler urges us to study this detailed analysis of the relative merits of Free Trade and Food Sovereignty. The authors demonstrate that ‘Think Global, Eat Local’ is a sound precept for our planet and for its inhabitants. 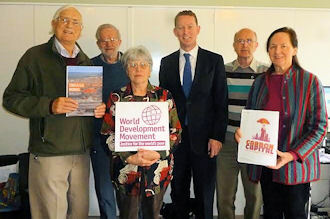 A delegation of Bexhill members of the Bexhill and Hastings WDM group (now known as Global Justice Bexhill and Hastings) met with Greg Barker MP on 21 November 2014. See the report in Hastings Online Times. Now sign the Global Justice Now online petition. See also report on sustaining agricultural biodiversity. On 1st November 2014, Amber Rudd, MP for Hastings and Rye, met members of the Bexhill and Hastings group of the World Development Movement (now known as Global Justice Bexhill and Hastings) to discuss concerns about the UK’s channelling of £600m of the Aid Budget through the G8’s “New Alliance for Food Security and Nutrition in Africa”. The government hopes the Alliance “will lift 50 million out of poverty” but, as Sally Phillips explained, WDM’s view is that “these policies would result in taking control of land, resources and profits away from small farmers and handing them over to multinationals, based elsewhere”. WDM, in common with many African organisations, believes that supporting “food sovereignty” is more likely to achieve the G8’s stated aims. Amber Rudd emphasised that the purpose of international aid was to assist poorer nations, not to support multinational corporations. “Every pound spent must be spent wisely.” She asked for further information, especially on the effects of tax havens and promised to raise WDM’s detailed concerns with the Department for International Development. Day of Action against the TTIP – the Transatlantic Trade & Investment Partnership. 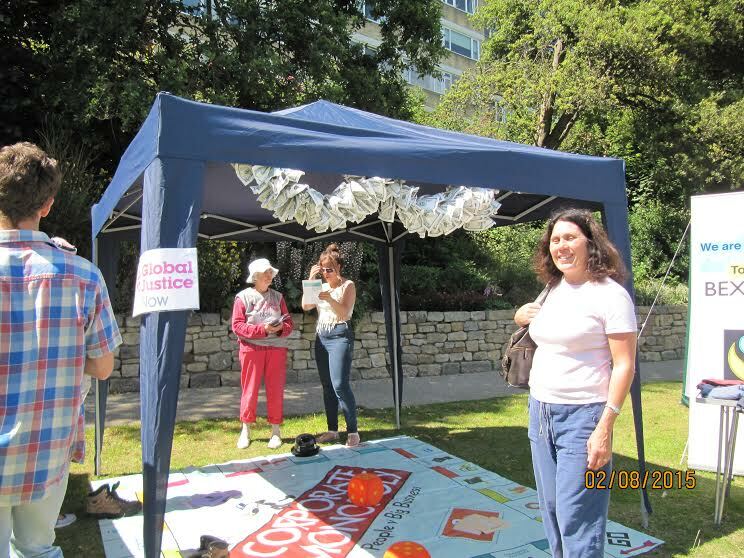 TTIP is being negotiated in secret in Brussels now, and 12 July 2014 was a national day of action, with events happening all over the country, including Bexhill. If you haven’t heard of TTIP already, it’s a new major EU-US trade treaty which has huge implications for democracy and public services, as it effectively opens up all public services to the market. Most importantly, it allows corporations to sue national governments if they attempt to regulate the market in favour of public spending, or to protect their citizens from market forces or from new technologies such as fracking and GM. It effectively rewrites the social contract between us and our governments. Bexhill and Hastings WDM: Day of Action against TTIP. Together we raised awareness of TTIP and the implications for our health, education and social care services, and got people signing postcards against the corporate takeover. 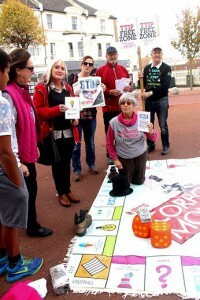 Members of the Bexhill and Hastings Group of the World Development Movement joined the campaign to stop multinational corporations from taking over African farmlands. 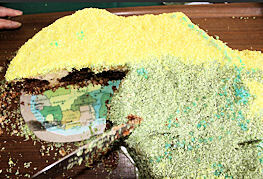 Slicing and scoffing the Africa-shaped cake. 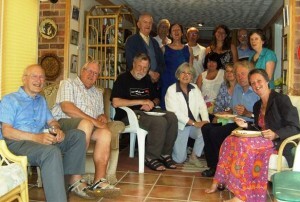 In May they joined local UNA members at an organic garden in Bexhill. To symbolise the way in which global companies are slicing up Africa WDM members, dressed as City CEOs, shared a large Africa-shaped cake. 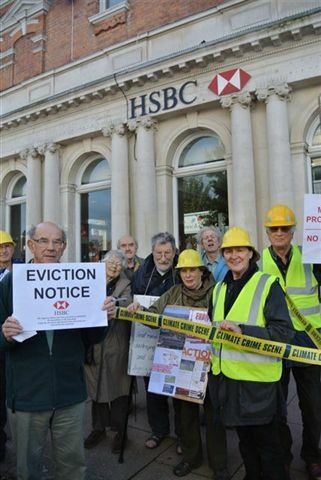 In October 2013 local members of the World Development Movement gathered outside the HSBC Bank, Devonshire Road, Bexhill, in a protest against the bank’s funding for fossil fuels. 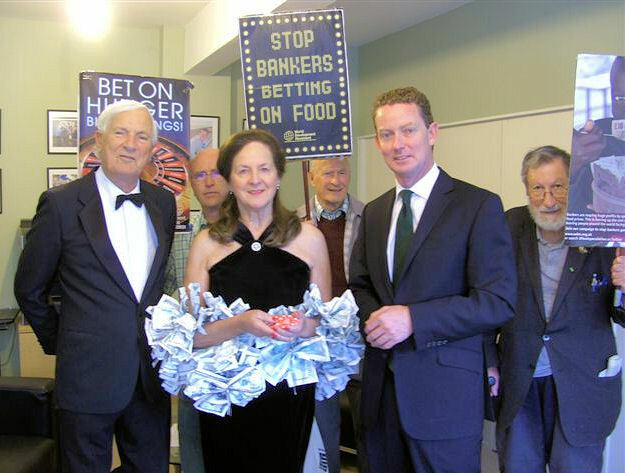 In March 2014 they met with Bexhill and Battle MP Greg Barker to ask him to push for new rules to stop UK banks pouring billions of pounds into the global coal industry. Greg Barker is the Minister of State for energy and climate change. The UK’s five biggest banks have invested £12 billion in coal mining around the world since 2005. Of all fossil fuels, coal has the most damaging effect on climate change. 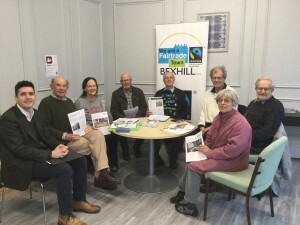 The campaigners from the Bexhill and Hastings World Development Movement group also highlighted the devastating effects of coal on people living where it is mined. UK banks are financing a coal boom in Indonesian Borneo, which is destroying the forests and rivers indigenous people rely on. In Colombia, whole villages have been wiped off the map by the massive Cerrejón coal mine, also financed by UK banks. In response, Greg Barker sent a letter saying he was pleased to have met with members of the group, and that he read the parliamentary briefing they gave him with interest. However his letter implies that he had missed the point. He wrote about discussing “the financing of coal-fired power plants”, which was not what the group talked about during their meeting. The group were very clear that they were calling on the government to stop UK banks bankrolling the coal industry and dirty mining projects. Accordingly the group will be sending a letter to Greg Barker to clarify the reason they met and the contents of the parliamentary briefing. Members of Bexhill and Hastings WDM and Fairtrade group held a stall at ‘A Garden Full of Cultural Delights’, an interfaith event organised by Hastings & District Interfaith Forum, Hastings Intercultural Organisation and Friends of St. Leonards Gardens. The group campaigned on both WDM’s Carbon Capital and Bankers Anonymous campaigns. Bexhill and Hastings WDM Group celebrated its 13th birthday anniversary on 15th July 2013 by inviting Sarah Reader to tell us about WDM’s Carbon Capital Campaign. She explained that British banks are continuing to fund destructive fossil fuel projects. Current plans for mandatory reporting mean that financial and other firms have to report on emissions generated by lamps and equipment in their UK offices, but are still not required to disclose the carbon footprint of their investments in fossil fuel mining and trading. 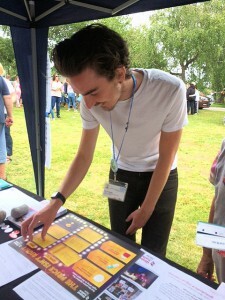 We were encouraged to explore the interactive infographic showing links between government ministers (including our own MP Gregory Barker) and the financing of the fossil fuel industry. Bankers are still gambling on commodity futures, driving up the price consumers must pay for food, especially in the Third World. 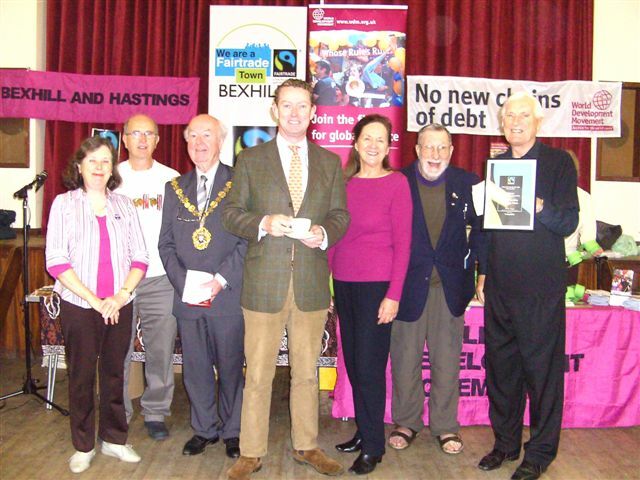 On 24th November 2012 Bexhill and Hastings WDM Group held a public meeting in Bexhill at which Miriam Ross, just back from Venezuela, presented a new film Growing Change. Venezuela has made food sovereignty a government priority, taking advantageof oil revenues to reduce their reliance on food imports, energy-based industrialised agriculture, chemical fertilisers and the market power of multinationals and supermarkets. Miriam told us about agricultural cooperatives which, by eliminating middlemen, have closed the gap between producers and consumers. Food sovereignty is an idea whose time has come, not only for Venezuela and the Third World, but for Europe too. 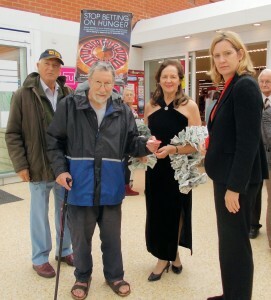 Hastings MP Amber Rudd accepts signed tokens opposing food speculation. 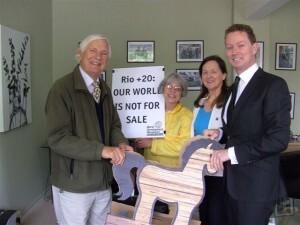 The UN Earth Summit: “Rio + 20”The UN Earth Summit took place in Rio in June 2012. A key theme of the conference was the “Green Economy”. This could have been a very positive agenda that prioritised economic justice and sustainable development. But the version being promoted by the British Government could be deadly for the world’s people and our planet. 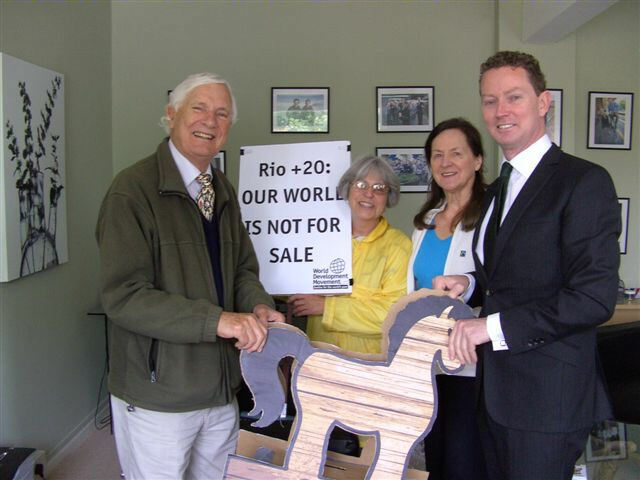 Read WDM’s verdict.On 2nd June, at the United Nations Association’s annual Open Garden Coffee Morning, Allan Bula, on behalf of UNA, and Denis Lucey, on behalf of WDM, signed a Declaration in Support of Rio. Callie Lister of Friends of the Earth, on behalf of the Stop Climate Chaos Coalition, recorded a message from Barbara Echlin for Bexhill MP Greg Barker to hand to Nick Clegg before he departed for Rio. Climate Justice for Africa? 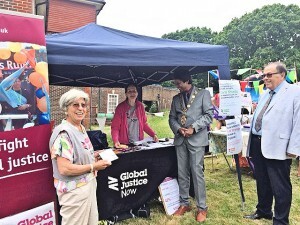 Minister of State for Climate Change Gregory Barker, Bexhill’s MP, faced questions from a local coalition of charities and environmental campaign groups at an ‘African Climate Connection’ event ahead of the United Nations conference in Durban, South Africa. 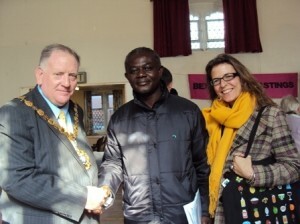 The event took place on Saturday 26 November 2011 at St Peter’s Church, Bexhill, a few days before Mr Barker flew to Durban to participate in the negotiations. 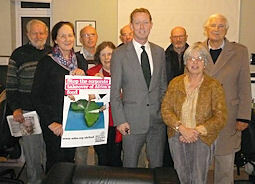 Gregory Barker said ‘I am concerned about the lack of urgency at the climate talks. The COP climate conferences are becoming a way of life for some people. We need to look at the science. In Durban I want to close the gap between countries’ pledges and what scientists say we need.’ He pledged to work for global agreement for a single legally binding treaty to keep temperature rises below 2° while acknowledging how difficult this will be. He also wanted to move forward the work on climate finance, adaptation and protection of forests started at Cancun. Christian Ecology Link Secretary Barbara Echlin ended the meeting with a strong plea to the minister to fight hard for the vital global deal that the world needs if we are to avoid climate chaos, storms and droughts. 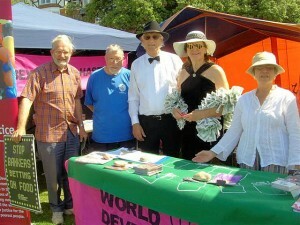 The event was attended by over 60 people and supported by a mix of local branches of national charities and agencies, and locally based groups: Bexhill Environmental Group, Cafod, Christian Aid, Christian Ecology Link, Fairtrade Bexhill, Friends of the Earth, Operation Noah, Rother Environmental Group, Tearfund, United Nations Association and World Development Movement. for One World Week, 29th October 2011. We were delighted that Gregory Barker was able to attend. It provided us with an opportunity to lobby him on WDM’s Climate Justice campaign: No New Chains of Debt.All activities were put on hold for a couple of minutes while Denis Lucey and Julia Dance performed an allegorical radio playlet , written by Julia. The audience heard a juggernaut crashing into and demolishing the house and small business of a poor woman. Refusing to pay for the damage, the juggernaut driver magnanimously offered the destitute woman a loan from the special funds administered by the association of juggernaut drivers. His final words: ” It’s that or nothing”. The punchy message was clear to all present: justice demands that compensation to help poor countries suffering drought and floods due to climate change, to which they have not contributed, should be given not loaned. 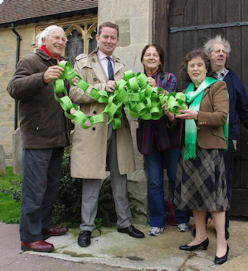 Following the playlet Greg was presented with a long paper chain, made up of links bearing messages of support for the campaign. Despite the debt relief granted to some countries, the UK is pushing new loans onto some of the world’s poorest countries through the discredited World Bank, in an attempt to meet its commitment to help them cope with climate change. WDM campaigners are calling on the government to give the money as grants through the UN instead. Denis Lucey said, ” Climate change has largely been caused by rich industrialised countries like the UK. Poor countries like Bangladesh, Nepal and Mozambique desperately need funds to help them deal with climate change, but the World Bank loans being pushed by our government will only drive them deeper into poverty. We are asking Greg Barker to take our concerns to Westminster and help ensure that solutions to climate change also tackle poverty. Otherwise they won’t work”. Summer 2011: Our summer campaign was against food speculation. View this new video from Australia. 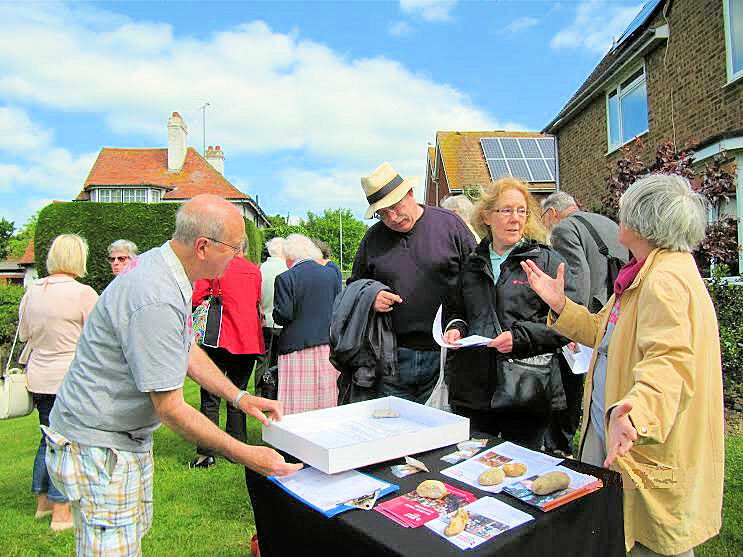 A public meeting in Battle, Sussex, on 20th May gave constituents a chance to challenge our MP, Gregory Barker, the Minister for Climate and Energy. 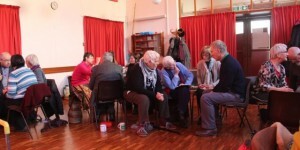 This meeting was arranged by local representatives of the national organizations who are part of the Stop Climate Chaos coalition, and members of local environmental groups: Bexhill Environmental Group, Cafod, Christian Aid, Christian Ecology Link, Friends of the Earth, Operation Noah, Rother Environmental Group, Tearfund, United Nations Association, and the World Development Movement. Paul Cook, of the Tear Fund, pressed the Minister to urge the World Bank to invest in renewable energy and stop subsidising fossil fuel. Martyn Williams, of Friends of the Earth, encouraged him to improve insulation standards for existing homes. Chris Rowland of OVESCo, an agency for sustainable energy, pressed him to continue the provision of feed-in tariffs for renewable sources of electricity. 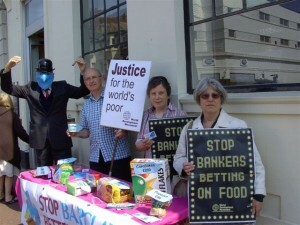 April 2011 was a month of action against Barclays. Barclays Capital is the UK’s prime culprit in food speculation, creating hunger by pushing up the price of key staple foods. Food prices have risen in the UK, but the effect in poorer countries has been devastating. There people are forced to spend most of their income on food just to stay alive. 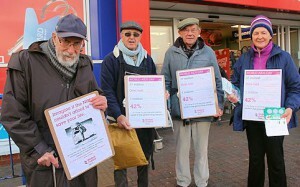 Barclays AGM was held in London on 27 April, so the local WDM group held a surprise stunt outside Barclays Bank, Bexhill on Tuesday 19 April. Local WDM chairman Denis Lucey dressed up as a banker, with a Barclay Eagle mask to attract attention. 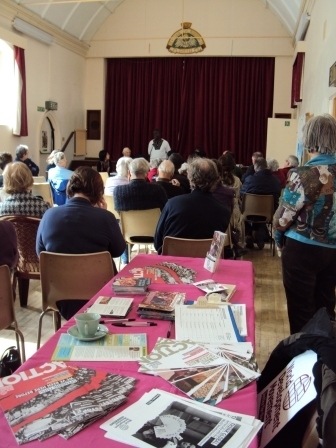 Bexhill was privileged to stage a session on Tackling Global Hunger on Saturday 12 March, organised by local groups WDM and Bexhill Fairtrade as part of discovering how to solve a most urgent and drastically worsening problem of our age. Before a large, inquiring audience, Heidi Chow of the World Development Movement gave a series of insights into the futures contracts which were brought in over 200 years ago to help farmers manage their risks. These contracts, which safeguarded basic foods, were deregulated in the 1990s, resulting in reckless speculation by wealthy bankers, causing the price of basics such as wheat, maize and rice to escalate.There is no shortage of food in the world but high prices mean that there is starvation. The reality of poverty and how earnings are spent was illustrated by a lady working on a rubbish tip in Kenya and having to spend most of her income on a bag of maize, with little left for other necessities; equivalent to someone here earning £300 a week and having to pay £250 for bread. An important point emphasised by Heidi is that money is not the answer to world poverty. Systems and attitudes have to change. 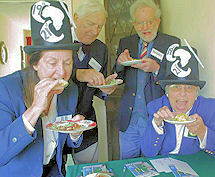 She urged those present to support WDM’s campaign for regulation of reckless speculation on food by wealthy bankers. Alex Yeboah-Atari was able to explain just how fair trading has changed the whole quality of life, educational , medical and environmental on the Banana Estates at the River Volta in Ghana. He wanted to pass on appreciation to all for supporting Fairtrade. He showed how it does work. 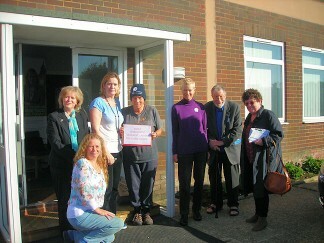 Hannah on behalf of Fairtrade Foundation congratulated Bexhill on their wonderful promotion of Fairtrade. She emphasised that in times of economic downturn like the present one, it’s no use telling people to tighten their belts if there is no room left to tighten! Fairtrade is a robust economic model; where it is in operation there is far less reliance on aid, so trade not aid is the answer. The Mayor, Councillor Jimmy Carroll, welcomed our learned and personable visitors to our town and thanked them for their contributions. at 13 Thornbank Crescent, Bexhill, TN39 3ND.